Home » Skin Care » What Causes Bumps on the Chest? What Causes Bumps on the Chest? Visible bumps on the chest can be a source of embarrassment and anxiety. They are a common but harmless issue in many cases. Other times, bumps on the chest can be a sign of a number of health conditions, including an allergic reaction, an infection, a skin disorder, and even skin cancer. Red bumps on the chest in particular are common, but the bumps can be flesh-colored as well. Itchy bumps on skin can be a symptom; however, a chest lump or bump can also be non-itchy, and either small or large. It’s also interesting that some bumps can be hard, while others may feel soft and even movable. It is important to understand why these bumps on the chest happen. This article will explain many of the causes of bumps on the chest, which may include cysts, acne, warts, and skin tags. Bumps on the chest may be caused by various conditions or objects. Insect bites; poison oak; and chemicals found in dyes, soaps, detergents, and clothing can all irritate the skin. Many conditions can also cause raised bumps on the chest. While sometimes the causes of these bumps are harmless, other times, there is serious discomfort and treatment may even be required. Most people are sensitive to mosquito bites. Many mosquito bites are innocuous and symptoms usually disappear in a few days. However, the red bumps and itching from mosquito bites can be downright dangerous for people with severe allergies. Other symptoms of a mosquito bite allergy include blistering, lesions, hives, and inflammation of the lymph system. On rare occasions, life-threatening anaphylaxis can also occur, and result in wheezing and swelling in the throat. In this case, immediate medical attention is required. Allergies aren’t the only problem with mosquito bites. Mosquitoes can also transmit severe diseases, such as dengue fever, malaria, yellow fever, encephalitis, meningitis, and West Nile virus. Bumps on the chest can also result from a skin lesion. Skin lesions are considered abnormal lumps, bumps, sores, or ulcers on the skin. Most skin lesions are benign, but others, like a pre-cancerous mole and actinic keratosis, are among the more serious types of skin lesions. Actinic keratosis results from excessive sun exposure and damage, and can sometimes lead to skin cancer. Most moles are black and dark brown; others are yellow, red, or flesh-colored. Some moles can develop into cancer. Blisters are another skin lesion that can result from steam burns, insect bites, sunburns, viral infections, or friction from clothes. Other skin lesions include rashes, pus-filled pustules, macules, papules, nodules, wheals, crusts, ulcers, scars, scales, rashes, and skin atrophy where the skin becomes wrinkled and thin from poor circulation or overuse of topical steroids. Acne on the chest can include blackheads, whiteheads, pimples, nodules, papules, pustules, and cysts. Acne can also be found throughout the body, including on the shoulders, back, face, upper arms, buttocks, and neck. Chest and other forms of acne occur when the pore sebum becomes clogged with dead skin cells, bacteria, and debris. Other symptoms of acne include scars left from popped nodules or cysts; dark spots on the skin; increased sensitivity to heat, sweat, or sunlight; and depression, anxiety, and reduced self-esteem. A cyst is a sac-like pocket of membranous tissue that contains air, fluid, or other substances. Cysts on the chest and other areas of the body are most often benign or non-cancerous. Cysts feel like large peas under the skin, and can result from acne, infections, chronic inflammation, inherited diseases, blocked ducts, or foreign bodies like earrings. The cause will depend on the type of cyst. Types of cysts on the chest can include sebaceous cysts, epidermoid cysts, and breast cysts. Consult a doctor when cysts become red or very painful. Warts on the chest are another type of chest bump. Warts are generally caused by the human papillomavirus (HPV). Most warts occur between three weeks and six months following exposure to a virus. Although warts are often not dangerous, they are contagious, ugly, embarrassing, and possibly painful. Common warts can grow all over the body, and they have a grainy, rough, and gray appearance with a rounded top. Other chest warts include flat warts and filiform warts. Warts can also hibernate quietly for a number of years before suddenly popping up due to reasons like skin irritation or a depressed immune system. Skin tags on the chest are soft, hanging skin that may sit on a stalk—also called a peduncle. They can appear anywhere on the body, especially where the skin rubs against clothing or other skin, including the upper chest, groin, armpits, and under the breasts. Skin tags may be caused when blood vessels and clusters or collagen become trapped inside thicker pieces of skin. Skin tags are considered benign, non-cancerous tumors on the skin. They also consist of a sore of ducts and fibers, fat cells, nerve cells, and a covering known as epidermis. Skin tags often go unnoticed unless they are in a prominent place, or are repeatedly scratched or rubbed by jewelry, clothing, or when shaving. Molluscum contagiosum is a skin infection caused by a virus of the same name. A key symptom will include benign raised bumps on the upper layers of skin, such as on the chest. These small bumps are often painless and will disappear on their own. They also rarely leave scars when left untreated. The bumps will last between two months and up to four years. Molluscum contagiosum is contagious as the name suggests, and it is spread by direct contact with the lesion of an infected person or a contaminated object like a piece of clothing. Besides mosquitos, other insects can also cause an allergic reaction and bumps on the chest. Other insect stings may come from hornets, wasps, bees, and fire ants. Additional insect sting allergy symptoms include pain, redness, swelling, hives, flushing, and itching. Most of these symptoms will go away within hours, butr some people may experience a serious anaphylaxis reaction and even death. Cellulitis is a common bacterial skin infection that can be characterized by its painful bumps on the chest. There is also a red, swollen area that feels tender and hot to the touch. Swelling and redness will also quickly spread. The types of bacteria often responsible for cellulitis include Streptococcus and Staphylococcus. Another name for a boil is a furuncle. Boils are fungal or bacterial infections of hair follicles. These infected hair follicles can be found on any part of the body, in addition to your scalp. Boils can be found on the neck, face, armpits, thigh, buttocks, shoulders, and the chest. Other symptoms include redness, tenderness, swelling, and possible scarring. When an infection worsens, a boil can become painful and hard, and as pressure builds, it can burst and release fluids like pus. The development of several boils in the same area is called a carbuncle. Bullae is the term for more than one bulla—a fluid-filled sac or lesion that forms from fluid trapped under a thin layer of skin. It is known as a type of blister. Infected bullae may contain a clear liquid that may also appear milky. If bullae occur due to trauma, the fluid may also contain blood. Bumps on the chest may also result from allergic eczema—also called contact eczema or allergic dermatitis. It is a rash that develops when you come into contact with allergens. Symptoms of allergic eczema can vary between each person, and in rare cases, symptoms can spread from one area of the body to another. Aside from bumps, other common allergic eczema symptoms include rashes; cuts; inflammation; itching; pain; a burning sensation; warm and tender skin; dry, red, or rough skin; and scaly, raw, or thickened skin. A lipoma is a slow-growing, fatty lump between the skin and underlying muscle layer that can form on any part of the body, including the shoulders, neck, back, arms, thighs, abdomen, and chest. A lipoma feels doughy but not tender while moving with slight finger pressure. A lipoma may also be pale, colorless, and soft to the touch. Lipomas are classified as benign tumors of fatty tissue. In other words, lipoma is non-cancerous and rarely harmful. Bumps on the chest can also be caused by a type of skin growth called seborrheic keratosis. The growth can seem worrisome or unattractive, like a wart or skin cancer, but seborrheic keratoses aren’t considered harmful. The growths can also be found on the face, back, shoulders, scalp, and abdomen. The round or oval-shaped lumps can start small, and they tend to develop a thick, wart-like appearance. They’re also often brown, and sometimes black, white, or yellow. Cherry angiomas, or red moles, are skin growths that develop on most areas of the body, including on the chest. Small blood vessels inside a cherry angioma can make it look bright red. Some cherry angiomas may be purple, blue, or black. With age, angiomas may become more raised. They may also feel firm to the touch, especially at the center. Since most cherry angiomas are often non-cancerous, most doctors choose to leave them alone unless they change shape, color, size, or bleed. 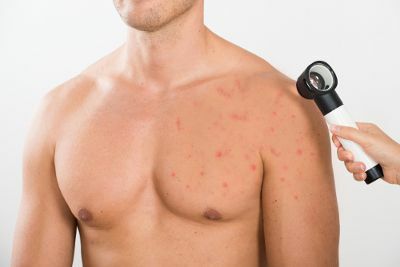 Bumps on the chest can also be caused by chickenpox. It is a condition characterized by itchy, red blisters that appear throughout the body. Within 48 hours, the blisters cloud over and dry out, and a crust develops. Chickenpox often affects children, and it was once considered a rite of passage in childhood. Chickenpox is a contagious infection caused by the varicella zoster virus. Most people will recover within one to two weeks. Before the chickenpox rash appears, there will be appetite loss, aching muscles, a fever, nausea, headaches, and a general feeling of being unwell. When skin is injured, fibrous scar tissue develops over a wound to repair and protect the injury. In some cases, scar tissue will grow excessively and lead to hard and smooth growths called keloids, which can be larger than the original wound. Keloids can be found on any part of the body, and most often on the chest, cheeks, shoulders, and earlobes. Although harmless, keloids create cosmetic concerns with lumpy or raised skin that continues to grow larger with scar tissue over time. Tanning or sun exposure may also scar the tissue and make it darker than the rest of your skin. Methicillin-resistant Staphylococcus aureus (MRSA) is an infection caused by Staphylococcus bacteria, which are resistant to many antibiotics. MRSA symptoms will depend on the location of the infection. Often it will cause mild infections anywhere on the skin, including on the chest. These small red bumps frequently look like insect bites, pimples, boils, or sores. Bumps on the chest can be harmless in many cases, and they don’t require treatment unless there is painful discomfort. Conditions like cherry angiomas, seborrheic keratosis, and keloids are not considered harmless, but treatment may be required to remove the cosmetic concern. However, other times, bumps on the chest can arise from more serious issues, like chickenpox, warts, and MRSA infections. Also, skin lesions like actinic keratosis can lead to skin cancer. It is a good idea to see a doctor if your bumps on the chest cause pain or discomfort, you don’t know the cause of the bumps, the bumps change or worsen in appearance, or last for longs periods of time, or if you suspect an infection or skin cancer. Ellis, M.E., “What’s Causing This Raised Bump on My Skin?” healthline, April 12, 2016; https://www.healthline.com/health/raised-skin-bump#1, last accessed Jan. 29, 2018. Kerr, M., et al., “Mosquitos Bite Allergy,” healthline, March 26, 2015; https://www.healthline.com/health/allergies/mosquito-bite, last accessed Jan. 29, 2018. “Skin Lesions,” ASDS; https://www.asds.net/Skin-Lesions/, last accessed Jan. 29, 2018. Holland, K., “What’s Causing This Skin Lesion?” healthline, July 26, 2016; https://www.healthline.com/health/skin-lesions, last accessed Jan. 29, 2018. “Top 10 Home Remedies for Acne,” Dr. Axe; https://draxe.com/home-remedies-for-acne/, last accessed Jan. 29, 2018. Delgago, A., “What’s Causing This Cyst?” healthline, Aug. 11, 2017; https://www.healthline.com/health/cyst#Overview1, last accessed Jan. 29, 2018. Carey, E., “Warts,” healthline, April 20, 2017; https://www.healthline.com/health/skin/warts, last accessed Jan. 29, 2018. Nordqvist, C., “All you need to know about skin tags,” MedicalNewsToday; https://www.medicalnewstoday.com/articles/67317.php, last updated July 26, 2017. Giorgi, A., “Molluscum Contagiosum,” healthline, Feb. 8, 2016; https://www.healthline.com/health/molluscum-contagiosum, last accessed Jan. 29, 2018. Murrell, D., “Insect Sting Allergy Overview,” healthline, Nov. 14, 2017; https://www.healthline.com/health/insect-sting-allergy, last accessed Jan. 29, 2018. Conrad Stoppler, M., “Cellulitis,” Medicine Net; https://www.medicinenet.com/cellulitis/article.htm, last accessed Jan. 29, 2018. “What Causes Boil?” healthline; https://www.healthline.com/symptom/boil, last accessed Jan. 29, 2018. Wint, C., “Bullae,” healthline; https://www.healthline.com/health/bullae, last accessed Jan. 29, 2018. Burke, D., “Allergic Eczema,” healthline, Nov. 29, 2017; https://www.healthline.com/health/skin/eczema, last accessed Jan. 29, 2018. Moore, K., “Lipomas (Skin Lumps),” healthline, March 8, 2016; https://www.healthline.com/health/skin/lumps, last accessed Jan. 29, 2018. O’Connell, K., “Seborrheic Keratosis,” healthline, Dec. 19, 2017; https://www.healthline.com/health/seborrheic-keratosis. “Cherry Angioma Risk Factors, Symptoms & Natural Treatments,” Dr. Axe; https://draxe.com/cherry-angioma/, last accessed Jan. 29, 2018. Selner, M., “Chickenpox,” healthline; https://www.healthline.com/health/chickenpox, last accessed June 15, 2017. Nall, R., “Keloid Scar of Skin,” healthline, Aug. 9, 2017; https://www.healthline.com/health/keloids, last accessed Jan. 29, 2018. Lights, V., et al., “MRSA (Staph) Infection,” healthline, July 11, 2017; https://www.healthline.com/health/mrsa, last accessed Jan. 29, 2018.